With help from HSN and UNICEF Kid Power, these Florida students are getting active and saving lives around the world. 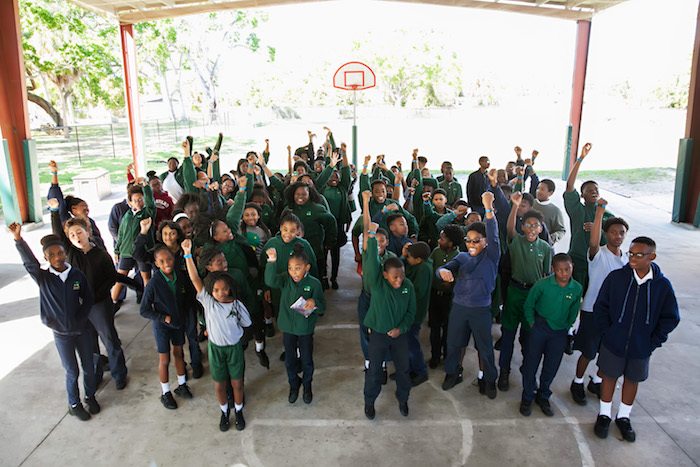 For the energetic middle schoolers at Academy Prep Center of St. Petersburg on Florida's Gulf Coast, helping malnourished children around the world is all in a day's work. That's because St. Petersburg-based HSN and UNICEF teamed up to empower the young humanitarian activists through the UNICEF Kid Power Schools program. The children saved by Kid Power need our help. The more we get fit, the more they get fit. Named to TIME Magazine's 2016 list of Best Inventions, UNICEF Kid Power leverages easy-to-use technology with the first Wearable-for-Good to convert students' physical activity into lifesaving aid for malnourished children. As they go about their day, the Kid Power Bands on their wrists track their activity levels. With every step they take and every dance move they make, the students earn points that unlock packets of Ready-to-Use Therapeutic Food (RUTF) used to treat a child with severe acute malnutrition. "I feel like I am doing something right for once," says 11-year-old Akio (caught midleap in the photo below, center right, wearing a blue jacket). "The children saved by Kid Power need our help. The more we get fit, the more they get fit. This has helped me look for ways to help in my community, like planting trees to replace the ones that we lose after storms." In June 2017, multichannel retailer HSN granted $25,000 to UNICEF USA to empower families in the local community. 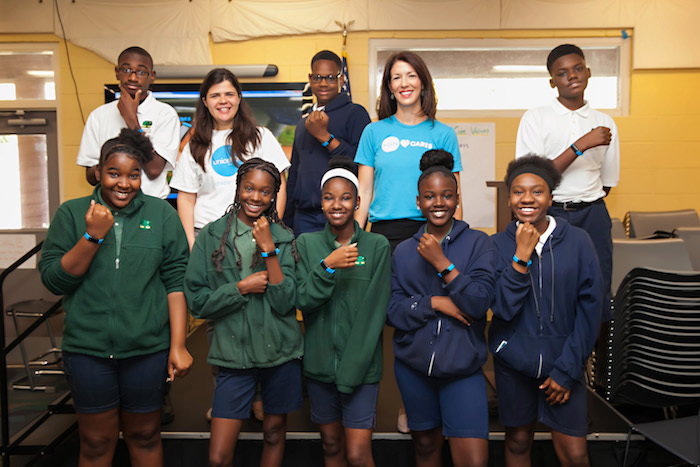 Andrea Masterson, who leads HSN's community affairs, teamed up with UNICEF USA to bring the Kid Power program to nearby Academy Prep so that students could save lives for the next three years. Then, last fall, 247 HSN employees participated in UNICEF Kid Power's 30-day activity challenge to help end global malnutrition. By embedding physical activity and philanthropy into their day-to-day lives, HSN employees unlocked enough therapeutic food to treat 60 severely malnourished children. It makes me happy to know I am helping other kids. I learned they are being saved every second and we are helping them stay alive. 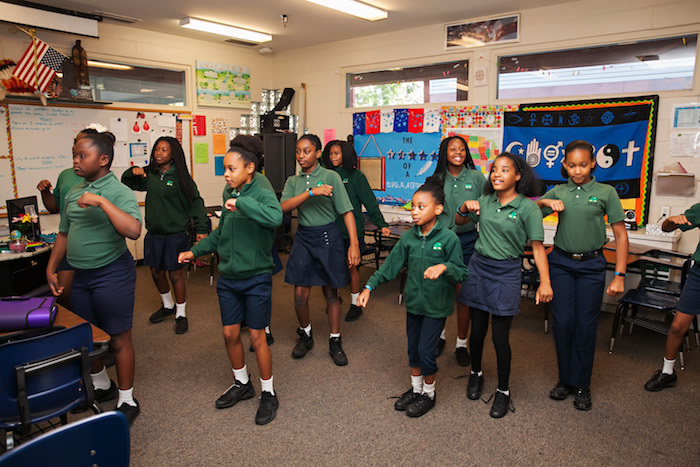 Teachers at Academy Prep lead their classes in Kid Power Ups, short, interactive videos that get kids dancing and moving, the ideal brain break to help kids re-focus and learn more. Each time the group completes 10 Kid Power Ups, they unlock one RUTF packet. "I liked it when we danced in the classroom to the Kid Power songs," says 11-year-old Tatyanna (top photo, right). "This made me run more and I like running. I've earned 253 points so far. I want to help others who have diabetes, like I have." "It makes me very happy to know I am helping other kids," says 11-year-old Miericle. "I learned they are being saved every second and we are helping them stay alive. I want to help kids and work with the homeless when I grow up." Launched in 2014, UNICEF Kid Power gives children and their families the power to help end global malnutrition one step at a time. 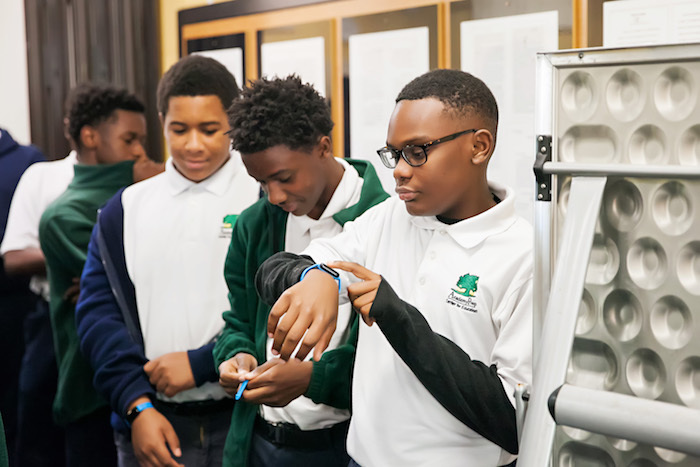 "Academy Prep Center of St. Petersburg, in partnership with HSN and UNICEF, has given our fifth through eighth grade scholars an opportunity to make an impact on malnourished children around the world," says Assistant Head of School Lee Lockhart. "The Kid Power initiative has helped our students use their energy and activity to provide food packets to children in poverty. Many outreach opportunities require participants to be financially involved, but Kid Power does not. That has been a great option to help our scholars do something beyond their world. This lesson of helping others and serving those in need cannot be lost on our youth." Many outreach opportunities require participants to be financially involved, but Kid Power does not. That has been a great option to help our scholars do something beyond their world. "One hundred AP scholars have stepped up and provided over 710 RUTF packets to date," says Lockhart. "One class of 13 fifth grade girls has earned 216 RUTF packets all by themselves. Their excitement and commitment to this program has been refreshing. It is encouraging to see today's youth, regardless of their own status, caring about others and doing something to save lives." Students at schools across the country, from New York City's Chinatown to the Pacific Northwest, are getting into the act, turning their natural energy into lifesaving nutrition. To date, Kid Power Team members from across the U.S. have unlocked more than 10 million packets of RUTF — enough "miracle food" to treat and save the lives of over 70,000 severely malnourished children. "I learned that kids in the world don't have clean water and proper food," says 13-year-old Kishaun (in blue jacket in photo below, back row). "I want to create opportunities to help youth in the future." I learned that kids in the world don't have clean water and proper food. I want to create opportunities to help youth in the future. UNICEF Kid Power classroom kits provide educators with Kid Power bands for every student and a host of tools and resources that integrate a global curriculum with experiences that give kids' actions real-life impact. "Doing Kid Power made me feel like I can do more things to help others," says 11-year-old Ja'Nay. "I like that getting active can help others." "It made me feel like a hero to help others," says 11-year-old Destiny (top photo, left). "It makes me feel good to know others are getting proper nutrition." To help bring UNICEF Kid Power to a classroom, donate today! If you are a teacher who is interested in participating in next year's UNICEF Kid Power Schools program, sign up here to be the first to hear about opportunities to bring UNICEF Kid Power to your classroom or group. HSN is dedicated to empowering women and helping families in the U.S. and around the world. Since 2010, HSN has raised awareness and critical funds to help UNICEF provide medicine, nutrition, clean water, emergency relief and education to children in need across the globe.